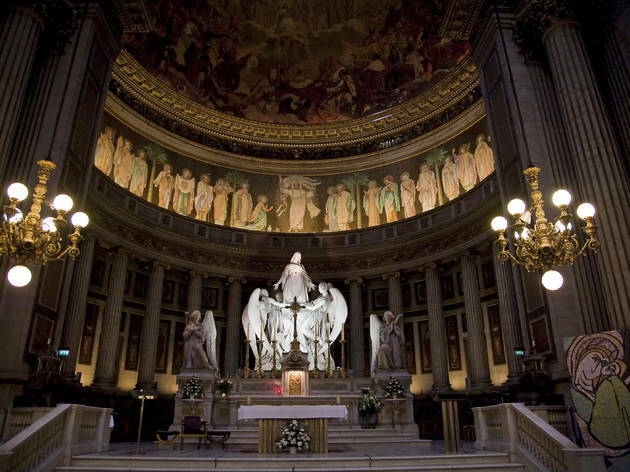 The building of a church on this site began in 1764, and in 1806 Napoleon sent instructions from Poland for Barthélémy Vignon to design a 'Temple of Glory' dedicated to his Grand Army. After the emperor's fall, construction slowed and the building, by now a church again, was finally consecrated in 1845. The exterior is ringed by huge, fluted Corinthian columns, with a double row at the front, and a frieze of the Last Judgement just above the portico. 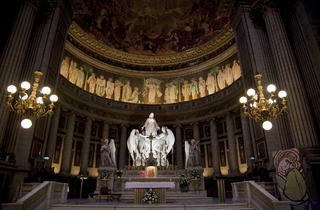 Inside are giant domes, an organ and pseudo-Grecian side altars in a sea of multicoloured marble. The painting by Ziegler in the chancel depicts the history of Christianity, with Napoleon prominent in the foreground. It's a favourite venue for society weddings.